More than 600 votes have been logged in to OFCC PAC's current poll question, pondering whether or not CCW Reform deserves to be a legislative priority in 2003. One day last week, the poll got some publicity from an unlikely source: the Ohio Coalition Against Gun Violence. On January 15, Toby Hoover forwarded OFCC PAC's announcement (nearly word for word), concerning the pending introduction of Senator Wachtmann's CCW reform bill, to her anti-gun extremists. 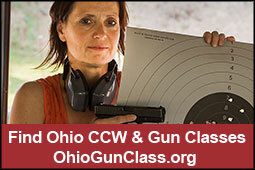 Hoover instructed them to call and inform Senators that the majority of Ohioans don't support concealed carry reform. That same day, the poll logged 22 votes AGAINST prioritizing CCW reform in 2003. Prior to that day, only two "NO" votes had been recorded, and since that day, zero have been recorded. We'd like to offer a hearty "welcome" to the OCAGV observers that voted in the poll, and we invite them to spend a bit more time on this website. Perhaps after some additional reading, they'll go back and throw a vote the other way! We're still taking votes on the right side of the homepage, or click here to access the poll.